Fifty Conservative MPs have demanded tougher strike laws be introduced to stop the “widespread misery” suffered by Southern Rail commuters being repeated. They want legislation that bans strikes on “critical public infrastructure” unless the courts judge the industrial action “reasonable and proportionate”, and they want unions to be legally obliged to retain a skeleton service, with half of journeys still running during strikes. 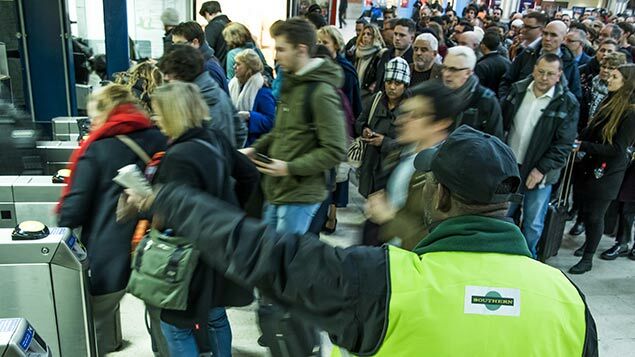 Steve Hedley, assistant general secretary of the RMT, which represents Southern conductors, said his members would “just break the law” if ministers introduced tougher laws, adding that the tougher legislation was “not going to happen”. The RMT has announced that conductors will next strike on Monday 23 January, while drivers, represented by Aslef, will strike on Tuesday 24, Wednesday 25 and Friday 27 January. New rules in the Trade Union Act 2016 include a requirement for a 50% turnout in strike ballots and in “important public services” such as railways, for 40% of eligible members to vote in favour of action. The implementation date for the new rules has yet to be confirmed, but is widely anticipated to be 1 March 2017.